The French are still numerous to consider voting both a right and a duty (‘un devoir citoyen’, as they say). This is probably why turnout – despite a wide-spread feeling that nothing ever changes – has been remarkably stable over the decades, especially at the presidential elections. Even the lowest participation ever (71.6% in the 1st round of the 2002 election, the one that famously saw Jean-Marie-Le Pen qualify for the runoff, precisely because many Socialists didn’t bother) is higher than what has been registered in the UK since the turn of the century (between 59.4% and 66.1%). And the decisive 2nd round consistently mobilises around 80% of the electorate (between 79.7% in 1995 or 2002 and 83.9% in 2007), which is above the turnout for the last four German Bundestagswahlen (only 71.5% in for Angela Merkel’s third victory in 2013) or even Spain (66.5% in June 2016, down from 69.6% in December 2015). It remains to be seen whether the voters’ motivation will be as high this time around. For various reasons people may be tempted to spend the four spring Sundays concerned doing other things than walking to one of the over 50,000 polling stations across the country. One of these reasons is the introduction of primaries. Things used to be fairly simple: you went to the 1st round of the presidential elections in order to vote FOR a person of your ideological preference among a large choice of candidates. Then you went to the 2nd round in order to vote AGAINST the candidate you disliked most. A month later or so you obeyed the new president’s dearest honeymoon wish to bestow him (no ‘her’ so far) with a stable majority in the parliament. Ever since the alignment of the presidential and the legislative elections in 2002, this is how it has happened. But now, the Americanisation of French politics has led the traditional parties to organise open presidential primaries, presumably with the objective to appear ‘closer to the citizens’ or ‘give people a say’ (any resemblance to referenda in other countries is purely coincidental). The Socialists introduced them at the end of 2011, with two women among the six candidates. It turned out to be a rather successful television event (which is what politics seems to be about nowadays), drawing a 5-million audience. And it fitted surprisingly well with the Socialists’ internal tradition of bringing different sensitivities to a formulation of a common denominator (most often the lowest, but that’s compromise), and compensated for the unexpected ‘dropout’ of frontrunner Dominique Strauss-Kahn. For Les Républicains, whose first-ever primaries are scheduled end of November, it will be major upheaval. 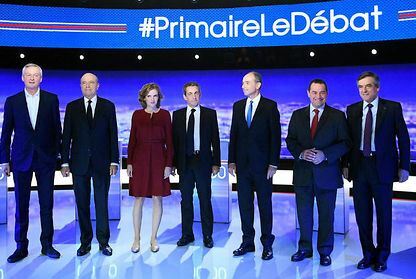 The very idea of having to choose between seven candidates (including only one woman) is in stark contradiction with the Gaullist tradition of the strong, inevitable, providential leader, who engages in a direct dialogue with the French people. During the first debate on 13 October, it was almost touching to watch just how physically difficult it was for Sarkozy to share speaking time with six opponents. It is also not sure to what extent the candidates will be capable of campaigning against each other without totally damaging the one among them they will have to defend and promote over the long months of the presidential campaign. All primaries have been designed as ‘open’, which means that anyone can vote, provided he/she signs a declaration of sympathy for the ‘values’ of the party concerned (which does not commit you to anything) and a modest fee of couple of Euros. Needless to say that for Les Républicains this opens the door to distortion of the vote by citizens from the left or the extreme right eager to crown the candidate that suits their own agenda best. Under these conditions, it is unsure to what extent loser’s consent will at all prevail. The eternal candidate of the ‘Centre’, François Bayrou (18.6% in the first round of 2007, and still 9.1% in 2012), declined to take part himself and declared his support for Alain Juppé, while announcing he would run against Sarkozy if ever he emerged as winner, which was a serious topic at the second TV debate on 3 November. The discrepancy between the intention of the primaries – choose a party’s best candidate for the highest office – and their real impact should be troubling for all French citizens. Given the very peculiar circumstances this time around – with the future winner of the Socialist primaries having next to no chance to make it beyond the first round and Marine Le Pen almost certain to be in the run-off without having to campaign particularly hard (and probably having a really good time watching the TV debates) – the winner of the ‘Right and Centre’ primary will most likely be the eighth President of the Fifth Republic. All this means that the ‘primaries’ really deserve their name, as they turn all the following elections, presidential and legislative, into ‘secondaries’. Which does not mean the ensuing presidential campaign between January and May will be meaningless. Quite the contrary: it will highlight once more all the pitfalls of the system, offering one more diagnosis of everything that is unhealthy about the Fifth Republic and the current state of French politics. As for the therapy, it’s unfortunately not even sure the patient wants to be healed. This is post # 2 on the French 2017 election marathon. This entry was posted in Current Affairs, Democracy & Citizenship, Politics & Public Policy and tagged citizenship, democracy, elections, France, France 2017, French politics, French primaries. Bookmark the permalink. Previous: Ref: France (2017), Campaigns, Elections, Hangover (forthcoming).